Network science is an emerging field. The purpose of this study is to investigate soccer attacks by using network science. In this study, by applying network science approach, four Turkish National Football Team’s attacks analyzed with an open-source NodeXL program. We have focused on two types of attacks: the attacks that end with goals and the ones that don’t. Our main aim is to see whether there is a difference between the network metrics of these two types of attacks? Using network metrics, for attacks in a same match we couldn’t find important differences but we have found real differences for networks’ metrics when opponent team changes. Our findings also support that micro measures can be used for new line-up’s. First of all, it should be mentioned that our study is a case study and the results of this study should not be generalized. However, our findings can be the start point for further researches with larger samples sizes. With the help of network science approach, the most effective players could be found, the most compatible line-up for the future games could be chosen and the opponent team’s key players could be analyzed. Barabasi, A.L. (2002). Linked: The New Science of Networks, First Edition Perseus, Cambridge, MA. Barabasi, A.L. (2014). Network Science, Cambridge University Press. Clemente, F.M., Silva, F., Martins, F.M.L., Kalamaras, D., Mendes, R.S. (2015). Performance Analysis Tool for Network analysis on team sports: A case study of FIFA Soccer World Cup 2014, Journal of Sports Engineering and Technology, July, 29. Cotta, C., Mora, A.M., Merelo-Molina, C., Merelo, J.J. (2011). “FIFA World Cup 2010: A Network Analysis of the Champion Team Play”, arXiv:1108.0261v1 [cs.SI]. Cotta, C., Mora, A.M., Merelo, J.J, Merelo-Molina, C.,(2013). ‘A network analysis of the 2010 FIFA world cup champion team play’, Journal of Systems Science and Complexity, 26 (1); 21-42. Çobanoğlu, H.O, (2015). Organizational Change and Applicability of Six Sigma Management Model in Turkish Football Federation, Unpublished Phd. Thesis, Anatolian University, Physical Education and Sports Department, Institute of Health Science, Eskisehir, Turkey. Dolles, H., Söderman, S., (2005). ‘Ahead of the Game -The Network of Value Captures in Professional Football’ Erscheinungsort: Tokyo. Dunne, C., Shneiderman, B. (2013) ‘Motif Simplification: Improving Network Visualization Readability with Fan, Connector, and Clique Glyphs’, CHI 2013, April 27–May 2, Paris, France. Grund, T.U. (2012). “Network structure and team performance: The case of English Premier League soccer teams”, Social Networks, 34 (4); 682-690. Kooij, R., Jamakovic, A., Kesteren F.V., Koning, T.D., Theisler, I., Veldhoven P., (2009). ‘The Dutch Soccer Team as a Social Network”, International Network for Social Network Analysis, 29 (1); 4-14. Mossop, B. (2012), ‘Basketball isn’t a sport. It’s a statistical network’, Wired, Arizona state Universty Researcher. Pena, J.L,, Touchette, H., (2012). ‘A network theory analysis of football strategies’, arXiv:1206.6904v1 [math.CO]. Valente, W.T, Coronges, K., Lakon, C., Costenbader, E., (2008). “How Correlated Are Network Centrality measures?, PMC, Jan 1; 28 (1); 16-26. Yamamoto, Y., Yokoyama, K. (2011). Common and Unique Network Dynamics in Football Games, PLos One, 6 (12). ISNAD Gürsakal, Necmi , Çobanoğlu, Halil Orbay , Çağlıyor, Sendi Ipeker . "A network-science approach: how different are the attacks of football?". 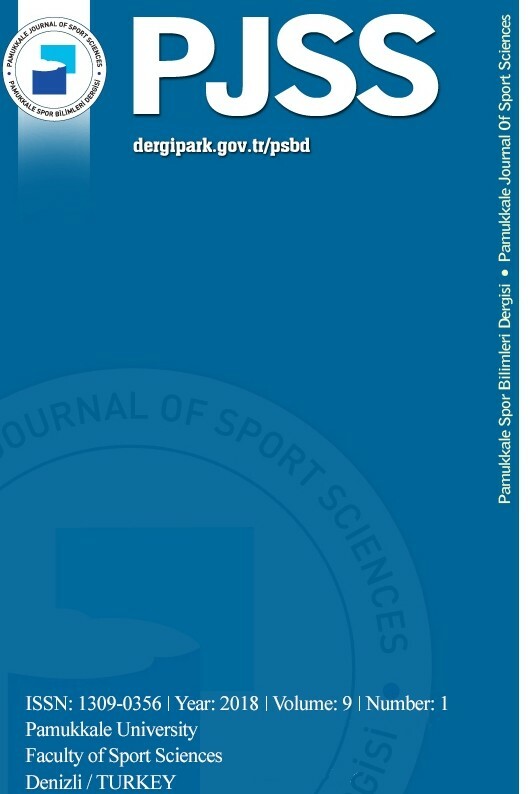 Pamukkale Journal of Sport Sciences 8 / 3 (September 2017): 45-57.